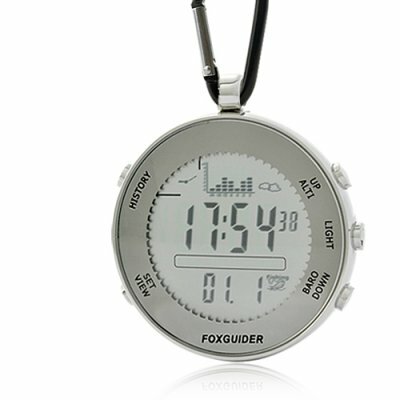 Successfully Added FoxGuider - Professional Waterproof Digital Pocket Fishing Aid (Barometer, Weather Forecast, Altimeter, More) to your Shopping Cart. Professional Digital Pocket Fishing Aid (Barometer, Weather Forecast, Altimeter, More): An ingenious device advising you where to fish! As experienced fishermen know, weather conditions affect behavior of creatures living in oceans, seas, lakes and rivers. Then the success of fishing depends a lot on actual atmospheric conditions. The higher the barometric pressure is, the higher the concentration of Dissolved Oxygen (DO) in the water. As a consequence fishes are more active, which means they are more eager to move, eat, be lured and thus take the bait. With the Professional Digital Fishing Aid, measure accurately all the environmental data needed for efficient fishing! Working mainly as a barometer, this great fishing device gives the local pressure with extreme precision to help you find the perfect places to use your rod and catch plenty of fishes! Since water pressure may sometimes differ from air one, put the premium fishing aid into water for exact measurement without danger; it is waterproof! Designed with efficiency in mind, you can record barometric data and water depth of up 6 different places to figure out where the environment is the most suitable for fishing. No more waste of time, no more countless hours of waiting for nothing except frustration! This high quality fishing gear also shows current weather and makes forecast for the next 24 hours, is a thermometer and relative altimeter. It can keep a 3 days history of weather, pressure trend, maximum/minimum pressure and temperature for analyzing in detail the best conditions and time to go fishing. For maximum convenience, a fish icon shows up automatically when the pressure becomes suitable for fishing (you can even set it according to your experience). What more? When heavy rain is detected, a storm alarm informs you to shelter! Become an expert in fishing with this exceptional Professional Digital Pocket Fishing Aid and enjoy fresh fish every evening for diner! It makes a wonderful gift for fishing lovers whether your dad, uncle or yourself! Brought to you at an amazing low price by the leader in electronics and gadgets, Chinavasion.